I have thrown dozens of painting parties at this point and I love them more and more each time. The world of “Wine and Sip” nights or “Painting and Pinot” or a local class at the brewery where you paint a flower in a vase, a cool ocean scene, or even a portrait of your pet, are all awesome and fun, but in my opinion, lack something… What is that something you ask? 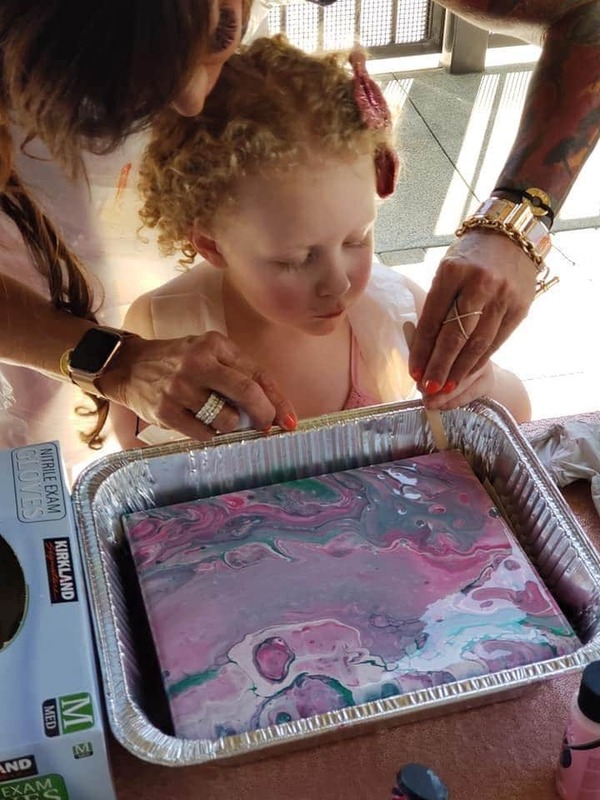 Well, in my opinion, there is nothing like acrylic pouring and what these typical paint events lack is the freedom of color expression and the abstract painting experience where everyone feels like they have created a masterpiece! Don’t get me wrong, those other paint night events are fun and it is really cool to paint something you didn’t think you could. 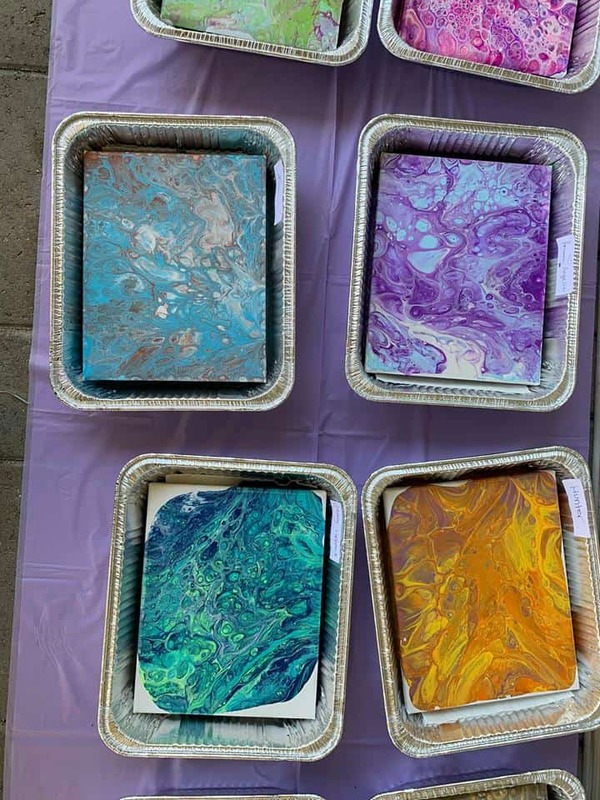 There are some really great art instructors out there, but in my experience, the vibe after a painting party where acrylic pour masterpieces were created, is much cooler than those other parties. I have taught both, so I am also putting myself down when I say that, so I hope nobody gets offended, but I challenge anyone who hasn’t tried teaching a pouring party, to try it and tell me the difference that they experience. The last party I did recently was a baby shower. Yep, a co-ed baby shower. When the host asked me to do It, I said yes, but warned her that the men might complain a bit. I assured her they would enjoy it once the process was started but they might balk at the idea at first. You see, I had just recently thrown a party with my family, which included my brother (36, no artistic interest) and some neighborhood boys (teenagers)… The men and boys enjoyed the process so much they made multiple paintings! My brother even hung his on the wall in the house. So, from that experience, I knew that men would be into it once they got started. The host and I went around a bit about the cost per person since she didn’t know if the men would actually paint. But we came to an agreement and the plan was set. When I arrived at the party, I set up for 15 participants and had 15 “Kits” as I call them, ready to go. Our plan was to do two waves, pairing couples up. One partner would paint after my demo, then we would reset the stations and the second painter would paint. This ended up working out amazingly well, as I will discuss in a little bit. The host introduced me, and I looked around the room as crickets chirped. I had a moment of panic where I thought “Oh no, this is a really tough crowd, this should be…. interesting.” The host picked up on the tension and said, “Don’t worry, guys you won’t be painting flowers and vases, its abstract, so anything goes.” Still… Nothing… Silence… Dead silence… With a nervous voice, I announced that I was ready to go, and I would meet them out at the tables. I couldn’t stand there for another second and get stared at, I just needed to get them going and show them the process. I know that anyone who tries it, likes it so I kept my confidence in tact and decided to just do what I do. They started to show up and as they did, I had them put on their aprons and stand near their stations. Their partners stood near them sipping on drinks and making comments. It seemed that the vibe was loosening up a bit. To my surprise some of the men chose to go first. They enjoyed dressing up with the aprons and found it really fun to make fun of each other. One of them saw a torch on the table, grabbed it and said, “Oh now we are talking!” I felt immediate relief. I started my demo, had the partners follow along on the cheat sheets that I had on the tables, and then did my painting. Everyone ooooh’d and ahhhh’d and suddenly the vibe changed. I instructed them to pick their colors and get started. The first groups energy was starting to ramp up. I could hear chatter about where they wanted to hang the paintings and what colors they should go for. The little teams were working well together. It was really fun to see the excitement as each painting was created and how everyone walked around checking out all of their friends work. We set aside all of the first groups paintings and the second group went. At this point the energy was fantastic and I was having a great time just going around and talking to people about color choices, checking on consistency and torching. There was no chaos at all, everyone had clear instructions, cheat sheets and because I had two groups going, the group that was not painting became my instant assistants! It was awesome! Surprisingly, the men asked for extra canvas’ so that they could do more paintings… in their favorite team colors, of course, but hey, they were engaged and having fun and doing amazing work! After everyone was done painting and taking pictures and checking out all of paintings, they went inside to open presents and eat cake. I covered all of the paintings with tin foil, and my “aftercare instructions” and set all of the paintings on a table to be taken home. They were all labeled with each of the artists names, so they were identifiable and kept on a level surface. Clean up at that point was easy. Remove all of the items that you don’t throw away and then just roll up the plastic tablecloth with everything else and voila! Done. I went inside to tell everyone where they could pick up their paintings and how to keep them level as they drove home and store them etc., I was greeted with hugs and smiles. I got comments like “that was the best baby shower I have ever been to,” “Can you have a party at a bunco night,” “I need this at a church group meeting,” “Can you do a 14-year old’s birthday party?” “Do you go to people’s homes? I have a book club and this would be a fun addition one week.” Of course, I said yes to each of those questions and passed out my card. One woman told me that she was really impressed at how I engaged everyone, that everyone enjoyed themselves and she said she couldn’t wait to hire me herself. She said that in her experience, groups like that in situations like this, were usually chaotic and that the set up and tear down was a challenge. She was impressed by how fast it was all done before and after and it seemed that I didn’t leave a mark. (no paint drops on the floor and no drop cloths were on the ground!). Success! 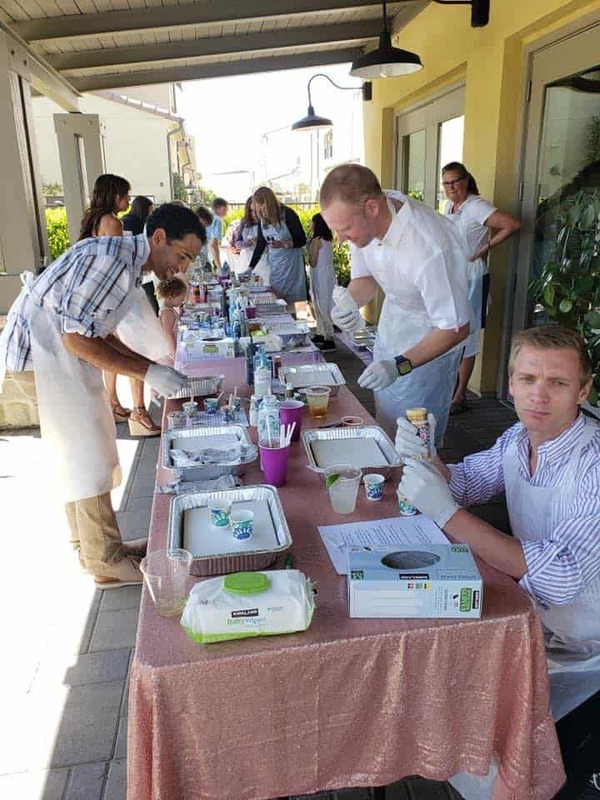 I have developed a “Class” on how to facilitate a large group acrylic pouring party. The class has videos of my set up as well as all of the checklists that I use to prepare. The cheat sheets on the tables are also shown in the course. 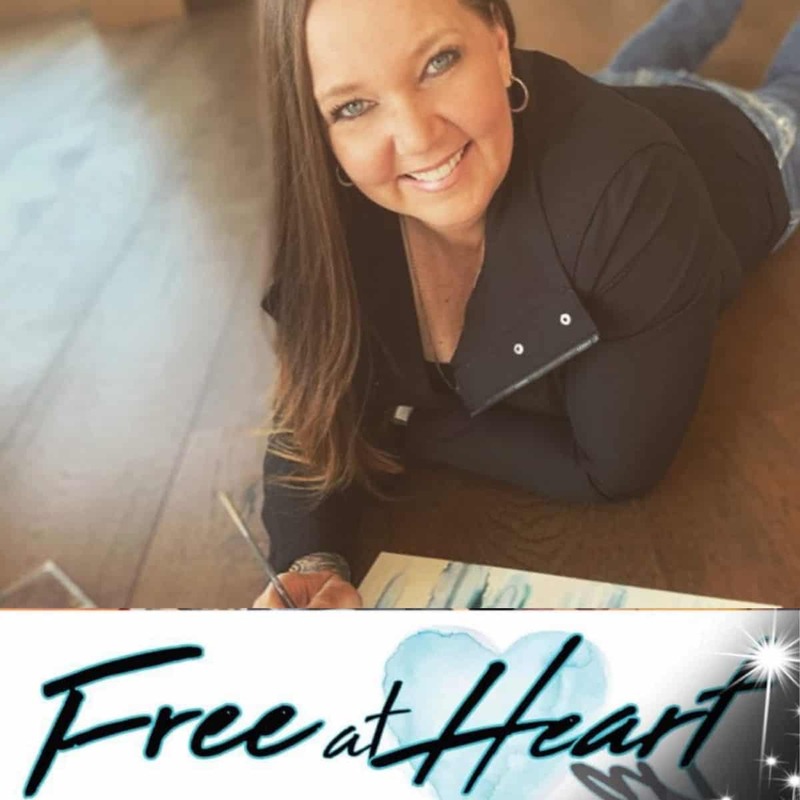 If you are interested in learning more about what I do, check it out here! I truly believe that I have found my passion and I am following my dream. Teaching these classes is extremely fulfilling. I hope you can find as much joy as I do when you teach your class. I would love to hear about your experiences. Thank you for reading about mine! My Name is Virginia Crowe. I consider myself an artist, however I don’t have any formal training. I find so much joy in painting and creating that it honestly has changed my life. I dove head first into art in 2018 to help myself get through some challenging life experiences. In this day and age a lot of information can be found on the web and that is exactly what got me started in my art journey. At this point, almost a year after discovering I could actually paint “cool stuff” as my son puts it, I am thriving personally and professionally as an art teacher. I share my love for Acrylic Pouring and Alcohol ink in group and private art lessons, and I have also put together E-Courses teaching my Alcohol Ink Flower technique and How to operate a successful Acrylic Pouring Party for large groups of people found on my blog. I also create greeting cards out of my art and sell to local businesses. I feel FREE doing art. I love how I have found an outlet for self expression that doesn’t involve words. My expression becomes beautifully colorful and something that will last forever. I love sharing my passion with others and I honestly believe I have found my life purpose. I genuinely feel elated when my students experience emotion when they create. I believe ART can change the world. It would not complete It?? I have just discovered acrylic painting and alcohol ink painting , I am loving doing it. I would love to find friends to do it with. I’m trying to register for your video but it won’t process.